Growing up with a father on the police force, William Valentine experienced a childhood slightly different from his peers. He observed life-threatening scenarios and witnessed his first dead body before the age of eight years old. 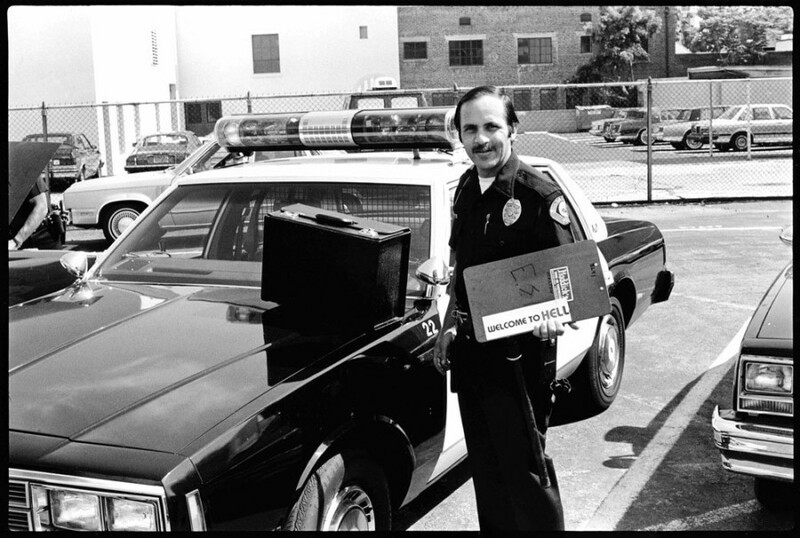 Years later, in 1984, as a photography student at Arizona State University, he decided to turn his camera lens on the world he knew -- the Pasadena Police Force. "My father was a reserve Police Officer at Pasadena PD at the time, he had been there a long time, and I grew up tagging along with him at the station when he went in to do admin paperwork or other tasks," Valentine explained to The Huffington Post. "Every supervisor in the department already knew me so getting my foot in the door was easy then as I began photographing I earned people’s trust by how I photographed. I got more than I expected -- first night out there was a suicide in the middle of the street and other stuff that went on. I realized quickly what potential the project had." Valentine's photographs capture the diverse moments that comprise daily life in the police force -- from checking for evidence and flashing an '80s mustachioed smile to handcuffing a suspect or tackling a potential criminal. The black-and-white images juggle the banal and the perilous at a swift pace -- mimicking the speed of life in the force. "I liked the action, I loved the images I was getting, and once the weather heated up things went crazy. Rock Cocaine and PCP were big back then, lots of street sales of drugs which meant foot pursuits and lots of violent crimes. It didn’t take long for me to realize I liked the 'hunt' or the challenge of tracking down criminals and especially those who hurt others." After spending over 1,000 hours in the field photographing the Pasadena PD, Valentine ended up joining the force himself, becoming a police officer for the City of Chino, California. It's nearly impossible to view Valentine's images as removed from contemporary questions of police brutality and accountability, and thus they provide a rich backstory to the critique facing the force today. Yet Valentine's images, more than promoting or critiquing police policy, provide a truthful glimpse into a world many of us speak of, but few really see. "With all my work I am interested in documenting my world as it was at that time the image was taken. With the Pasadena PD series I wanted viewers to see the world from the Officers’ perspective and to understand some of the things they have to deal with. These images were taken long before the TV show 'Cops' so this world was really unknown to people who had not been there in person to see it. I also wanted to show the human side of the officers as well. I am always hopeful the viewer will bring an open mind and that my images will inspire thought and insight. With the Law Enforcement images I am hopeful people will also gain some appreciation for what officers go through and how ugly certain elements of society really have been or are still today." Take a look at the images below and let us know your thoughts in the comments.